Second album from Welsh prog rockers. Rob Reed (Magenta) guests on the track 'Masheena'. 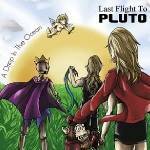 More information: 'A Drop In The Ocean' is the second album from Welsh prog rockers Last Flight To Pluto, and is the follow-up to 2015's See You At The End. It was recorded at Oakwood Church studios in South Wales under the stewardship of Nick Lloyd. Rob Reed (Magenta) guests on the track 'Masheena'.